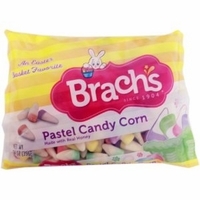 Brach's pastel candy corn also known as bunny candy corn. Honey flavored candy in the shape of corn in pastel colors. These pastel candy corn is a perfect Easter Candy. Fill you Easter Baskets, candy dishes or use when doing your Easter Baking. These tasty treats are the same as the traditional candy corn you find at Halloween just in pastel colors. Now you don't have to wait a whole year for your candy corn.